Although I left school in September 1945, it wasn't until the winter of 1948 that my parents let me go to work in the pit. My Father had been a coal hewer before the Second World War and he didn't like the idea of me working in the pit under private ownership. Father worked at Outwood Colliery. This pit closed due to a huge underground fire and he then found work at Ladyshore Colliery, Little Lever. On the first of January 1947 all the pits in the country were nationalised and standard terms of employment were laid down by Parliament. October 1948 I went along to the office at Brackley Colliery in Little Hulton and applied for a job. They sent me for a medical right away. 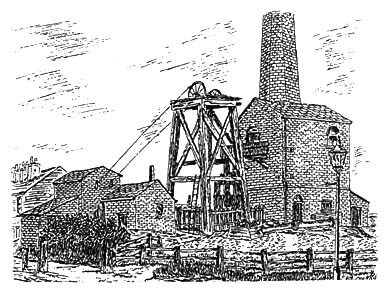 Proving to be fit enough I began work at the colliery a week later. I was 17 years old then. No man could work underground without having done six months basic training. While I was waiting for the next class to start, I was found work on the surface. I had a variety of jobs from emptying wagons to loading materials in tub for going underground and other general work on the surface. We worked outside in all weathers. They hadn't built the pit head baths at that time, so when the shift was over you would just go home, wet or dry. My shift started at 7am, snap time 10am to 10.25am and we finished at 2.15pm. If you arrived late you were sent home. The buses for Little Hulton started at Thynne Street, opposite the Painters Arms Pub, which is now Mr D's. The bus number was the Number 12 just like it is today. The buses left at 5.50am 5.55am and 6.00am and you could get one at 6.10am but this bus didn't reach the pit until 6.50am which was cutting it rather fine. These buses were always full by the time you got to Sapling Road, because besides Brackley there were also men working at Mosley Common and Sandhole pits. Most of the men on Daubhill were pit men. As well as the pits mentioned previously, men also caught the trolley bus to Atherton and Leigh and were employed at Chanters, Gib field, Gin Pit, Parsonage, Bedford Nook and Cleworth Hall. All these pits sent lads just like me on basic training. I was the only one from Brackley and I was soon to make new friends. January 1949 I began basic training. It was well organised and split into alternative weeks. One week spent at Howe Bridge Pit, Atherton and one week at Leigh Technical College. The first day at Howe Bridge we were issued with a helmet, a pair of boots and a belt. They had baths there so we could also have a shower - which most of us didn't. Catching the bus home was the first priority. At Howe Bridge we were taught basic pit skills in safety, methods of working on the surface and underground and I will never forget the occasion we were taught first aid at the nearby Briarcroft Hall. Everyone passed their first aid exam and I still have my certificate, dated February 1949. The time spent at Leigh Tech was an extension of school with plenty of pit data added. The N.B.C. gave every young person the chance to become Colliery Manager - that was their policy. Some did succeed in gaining higher places. Basic training completed and back to Brackley. I was employed underground at no 1 pit bottom, regular days, shunting coal and empties. This was to get used to underground discipline. I found the work enjoyable but I soon got bored. My next job was on the Haulage, taking materials to the coal face, at least 20 yards off. Unless you were Face Trained it was illegal to go within 20 yards of the face. I was to do this kind of work for the next 14 months. We still had no pit baths, you went home as you were when you came up the pit. I often wonder how the other passengers found the buses acceptable for use when probably half an hour earlier it had been full of pit men in their dirty clothes. There was a difference now being employed underground, you had to get your lamp before 6.50am and be underground. The first winding down was at 7.00am. So much about work, now some reflections about play. Every Friday afternoon I went to the slipper baths on High Street. I would dash home first, Mother had everything ready in a brown paper bag, (with string handles) clean towel, shirt, socks and vest. It was always a dash, because one of the pits I have not mentioned did not have baths either. That was the Victoria Pit (known as the Owd-Loan) at Deane, just behind the petrol station on Beaumont Road. Every Friday was rough and tumble with the lads from the Pigeons. Sometimes we would end up two in a slipper bath. Most evenings I would spend out with my friends. Our meeting place was Drinnans at the corner of Peace Street. We were never short of anything to do in these days. We were really spoilt for choice. During the week we would go to the pictures - there was the Ritz, Regal, Tivoli, Majestic, Windsor or the Regent. At the pictures the programme changed on Thursdays on the first house. Clarendon Street youth club was another favourite place. On Saturdays we would go to St Peter's and Paul's, dancing to the Assembly Six. Admission 1/6. Sunday night as often as not, it was records at St Ethelbert's, 9d, the late Father Breen as disc Jockey. Later we were to get more ambitious and for 2/6d we would go on the Passion Wagon to Blackpool, including admission to the Tower. It left Bolton at 6.00pm and left Blackpool Central at Midnight. There really were plenty of options for the young in those days. We were too occupied or too tired to cause any grief and besides the local bobby would give you a clout at the back of the ears. Happy days, unforgettable times. Most of the houses on Sapling road had structural damage cause by underground workings from Brackley pit. Victoria pit closed Oct l960. The cage could only hold four men each winding. After the trams stopped running up Deane Road, the Manager from the pit bought the tram lines near the pit and he had them cut up used them as supports for junctions underground. The Victoria pit worked coal under Hulton Lane but left a pillar of coal under the hospital. Since the 1st of January 1947 Nationalisation Day till June 1971, 59 pits closed in Lancashire. As well since that date the following pits have closed; Cronton Bank Hall, Sutton Manor, Bold Golbourne, Agecroft and not previously mentioned, Standish Hall Drift Mine 1961 and Dairy pit, Wigan 1962. Both the Oddfellows Arms and the Stags Head on Derby Street (favourite haunts of pit men) have even now more than 20 plus coal chimneys visible. And finally, on a lighter note. If you happened to be at a loose end on a Saturday night, all you had to do was walk down to the Lido Cinema. Starting at the Balmoral Pub then next to the New Zealand Chief - a gill of beer in each. By the time you had reached the Stag on Daubhill you would have had the opportunity to have a drink in 27 public houses. No wonder Daubhill was renowned for its pit men.